On November 1, 2016, Microsoft will stop releasing updates to Junk Email definitions for Outlook's junk Email filter. 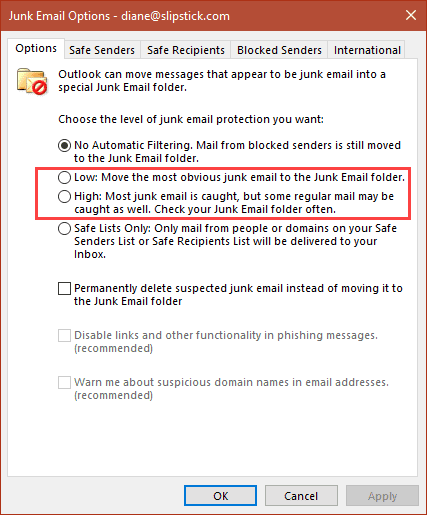 The junk email filter will continue to work in Outlook, using the last definition installed, it just won't be updated going forward, which will reduce its effectiveness in the future. The SmartScreen filter in Exchange Server is also affected and will not be updated going forward. SmartScreen Spam filtering was introduced in Outlook 2003, moving suspected spam (and occasionally, valid messages) into the Junk Email folder. It's not perfect by any means as client-side filtering has a couple of problems: if you use multiple computers, each Outlook will filter the mail, possibly filtering mail that isn't spam or was previously marked "not junk". If you use a smartphone, spam will be downloaded, wasting bandwidth and storage space. For this reason, server-side filter is generally better as the junk email is filtered out before Outlook or your smartphone downloads the mail, but when you use server-side filtering, SmartScreen could still move mail to the junk folder that was white-listed in the server's filter. Another problem is that spammer's behavior has evolved. In the past, a spammer could use the same campaign for weeks, allowing plenty of time for filter updates. Now it's often one and done, within hours and by the time Outlook's filter definitions are updated, the spammer has moved on. Spammers also hijack reputations from legitimate domains to trick content filters which reduces the effectiveness of the filter. Serve-side filters can be updated much faster and usually are better at content filtering. This change won't negatively affect Office 365 Exchange Online or Outlook.com users as their email is scanned by Exchange Online Protection (EOP). Outlook users with Gmail, Yahoo, or other email accounts will be affected as the filter will not be updated going forward. Users with these accounts may have spam filtering at the server level (such as at Gmail) or they can install a third party utility if Outlook's spam filter isn't meeting their needs. Again, if server-side filtering is offered by your mail host, it's recommended that you use it. Outlook’s Junk Email Options will not be changing and the Junk Email folder is not changing its status as a default folder (and can't be deleted). The current junk mail definitions will continue to work, although its effectiveness will be reduced as it ages, and users will be able to change the junk mail filtering level as needed. The safe and blocked sender's lists (and international filter) are not affected by the SmartScreen filter and will continue to work. The Low and High filter options will be less effective as time goes on. How can I get Outlook to NOT disable hyperlinks in my spam folder. It's OK to sort them there, but I should get to decide to use the links! My junk e-mail is having issues. A whole weeks worth was automatically deleted, but the week prior remained. Initially my junk was in there for 2 weeks and then deleted automatically. I made no changes but then it become just a week, and now I have whole days that get deleted, or the mail isn't even going into it in the first place, as I will have days with no junk, where previously I at least get 5-6. It doesn't seem to be consistent except that all this is happening without any settings having been changed. I don't want my junk deleted automatically and would like it to go back to the 2 weeks. Setting it to allow POP folders hasn't helped. Do you know if your account was migrated to the new servers? How are you connecting to the server? I know something happened to the EAS protocol on the new server last week that messed up some people's mailboxes. Junk mail specifically wasn't mentioned but some people were missing mail.